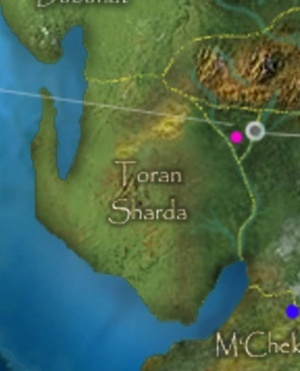 Toran Shaarda is the land of the dracon. The word Shaarda is difficult to translate from the dracon tongue. It simultaneously implies order, stability, and rock. Essentially, the message conveyed by the dracon to others through this name is that they see their homeland as the bastion for Toran's influence. It was here that the race was created by Toran, and where they still live to this day. The terrain of this country is made up of sandy hills and small areas of dry desert. Vegetation is often sparse, though large plains of grass like those found in the Kurathene Empire to the north are also common. The dracon are a curious race when viewed by their fellow Avlissians. To the untrained eye, they look largely the same. They may come in different colors, but the differences in their features are hard to discern. Oddly enough, they have the same trouble when looking at non-dracon. They have a tough time distinguishing between gnomes and halflings, and elves and humans, etc.. To their eyes, the world is a plane of Order, punctuated by staccatoes of Chaos that are to be dealt with harshly. Details that they deem important are scrutinized very closely, but information that is deemed irrelevant is glossed over with barely a glance. The nation of Toraan Shaarda's operation relfects this attitude. It has stringent laws that must be followed by all. Ignorance is no excuse, and punishements can be harsh. The governmental structure is complex and difficult to understand. Multiple layers of administration control the tiniest facets of life, though they all work together flawlessly, albeit slowly at times. At the top of the structure is the Kur'i'dah, which roughly translates into "all perpetuating source", and when translated into other languages gives implications of a hive king or queen. The main function of this government is to ensure total equality and stability in the land. It not only creates the armies of Toran Shaarda, but also ensures that every citizen is provided for with carefully managed resources and distribution. Still, life is not all work and no play. The dracon have been known to have a fun side, within the bounds of order, or course. Their social organization has also largely been described as hive-like. They like to live in large multistory houses, where members of the extended family all cohabitate as one unit. The oldest and wisest dracon is usually regarded as the home leader to whom everyone pays immediate obedience. Cities often have hundreds if not thousands of these homes, which all collaborate to educate and train their children in whatever vocations are necessary for furthering the whole. Many such settlements exist throughout the land, with the capitol city, Bin'ah, being the largest. Somewhere along the coast of Toran Shaardah, there is rumored to be a protected port that few have ever visited. Supposedly, this port is part of a city that does not conform to the normal dracon way of life, but is something far more spectacular. What that is, no one can tell, for there are no ships that leave or enter this port to tell the story. In addition to dracons, wemics are also known to exist here. This page was last edited on 10 June 2016, at 21:37.